My list of to-try restaurants keeps on growing as Toronto's food line up seems to get better by the day. 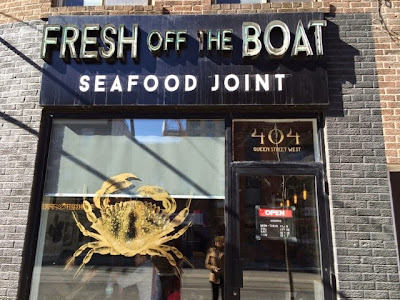 Yesterday, I finally got a chance to try out Fresh Off The Boat, a fairly new and frequently talked-about seafood joint, off Queen Street West and Spadina. 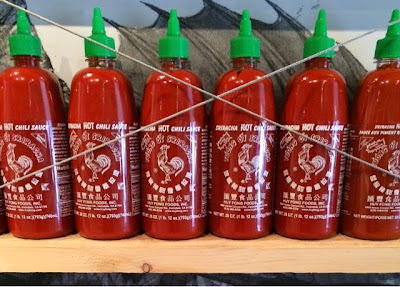 The restaurant's name is a tongue-in-cheek allusion to the spot's Can-Asian flare, as well as its (ah-mazing) seafood selection. 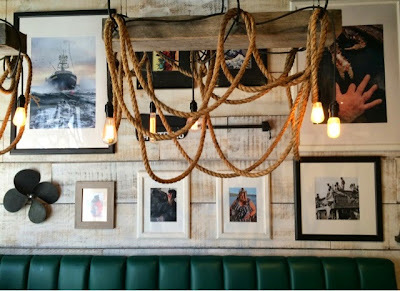 I am a sucker for interior design and everything about this restaurant was perfection! 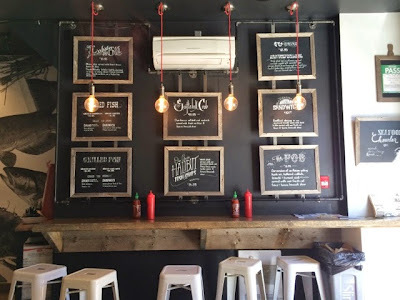 From the red hot sriracha display to the wooden 'boardwalk' wall, to the fishing rope hanging off the light fixtures, every detail in this space contributed to its effortlessly cool and laid back atmosphere. Love a non-pretentious store front. 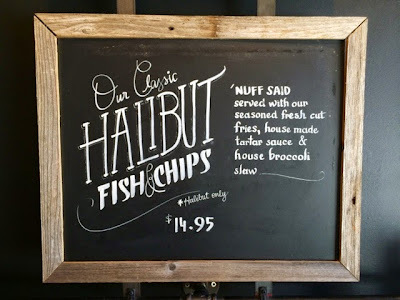 Charming details, down to the chalkboard menu display. I need to do this in my house. Though replace the picture of the half naked fisherman. 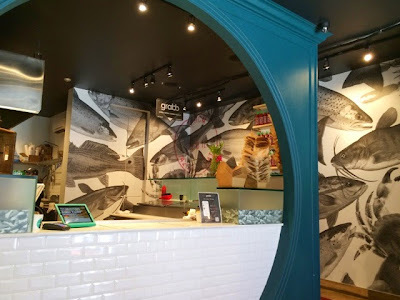 Can you tell the menu includes fish? Caution to all you tall people. We didn't even order this, but it was the only one I could reach with my height and take a full-on shot of. Awkward. 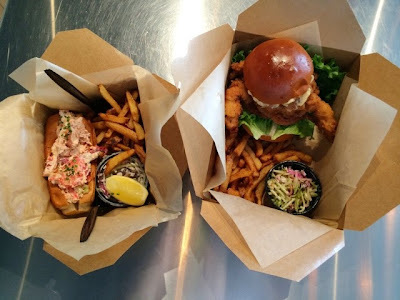 Left: Lobster roll with a broccoli slaw. Right: Soft shell crab burger with the same fixings. Verdict? 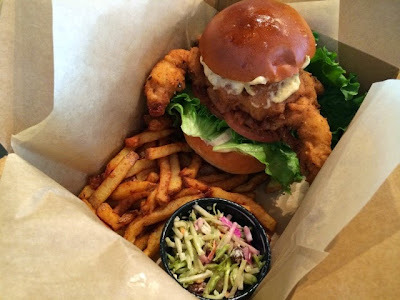 The soft shell crab burger was divine. This picture doesn't do the burger justice in terms of size and texture. The crab was fried to perfection and the breading didn't crumble off as you eat. Such a beautiful problem to have but the crab legs were spewing out the sides of the sweet bun - definitely not a first date restaurant. Figuring out how to eat this bad boy was a feat on its own. Another winner - equally delicious as the burger in my opinion! 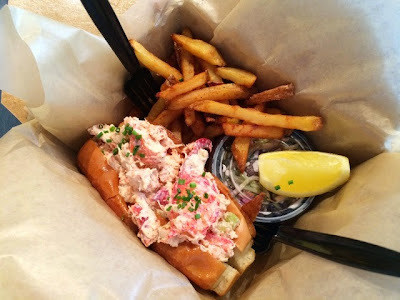 The bread was buttery and crispy and the lobster was so incredibly tender and sweet. They don't skimp out on the seafood either. We literally had trouble finishing both entrees. 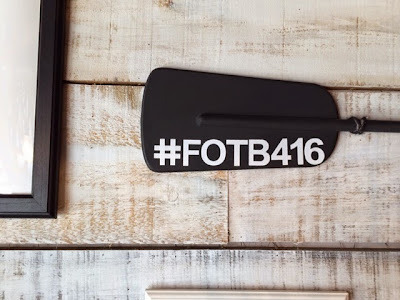 #FOTB416 is such a great addition to the Queen West strip. 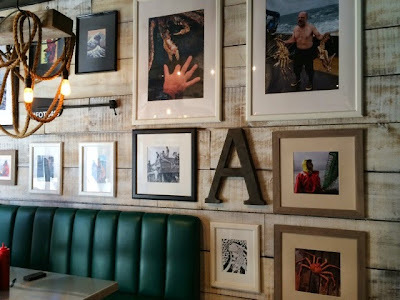 The decor is top-notch and the food is just as superb. Definitely recommend to all you seafood lovers.